Over the years, I have worked closely with the owner/CEOs of hundreds of companies with annual sales of less than $20-million and however different those companies are in most respects, many of them were launched by entrepreneurs who had given little (if any) thought to the possibility of selling that company eventually. Their primary focus was on two basic needs: survival and security. 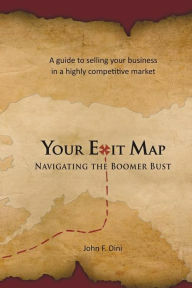 Few of them read John Dini’s 11 Things You Absolutely Need to Know About Selling Your Business and — to the best of my knowledge — none has as yet read his latest, Your Exit Map. Anyone planning to launch a company should keep that comment clearly in mind. Long ago in The Art of War, Sun Tzu asserted that “all battles are won or lost before they’re fought.” That’s true when launching a company and also true when selling one. The success of each is dependent on the other and no one offers better information, insights, and counsel than Dini does to help achieve that success. Dini is indeed a “must source” for aspiring entrepreneurs, those who have launched a company, and those who are thinking about selling it. o Post sale: Then what? Dini provides the “Business Owner Interview Questions” just before the “Glossary” at the book’s conclusion. These are excellent questions that suggest business issues, some to which — in varying degree — “Influencers” respond: Tom James (Pages 26-27), Geoffrey Brown (42-43), Kevin Mayeaux (62-63), and Paul Viren (78-79). Dini provides dozens of questions that readers must ask of themselves as well as of other sources such as small business owners, and professionals (e.g. bankers, accountants, attorneys, who specialize in small businesses. It should be noted that Dini recommends asking the right questions. I also wish to commend him on the creation of a website hat provides an abundance of resources of incalculable value. To repeat, I think John Dini is indeed a “must source” for aspiring entrepreneurs, those who have launched a company, and those who are thinking about selling it. It will also be valuable to those who are buying a business in a marketplace that is more volatile, more uncertain, more complex, and more ambiguous now than it was at any prior time that I can recall. Your Exit Map is a brilliant achievement. Bravo!